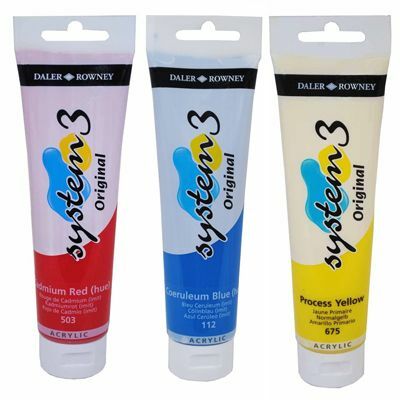 Daler Rowney System 3 Acrylic is a water-based medium bodied acrylic offering all the virtues of light-fastness, permanence and covering power in an economical range of 60 colours. System 3 dries within minutes to an eggshell satin finish and has a higher tinting strength than any others in its class. Ideal for art and craft projects in schools, outdoor mural work and also for professionals or amateurs. Endless creative opportunities exist as they can be used on a wide range of surfaces or combined with Daler-Rowney System 3 and Acrylic Mediums.